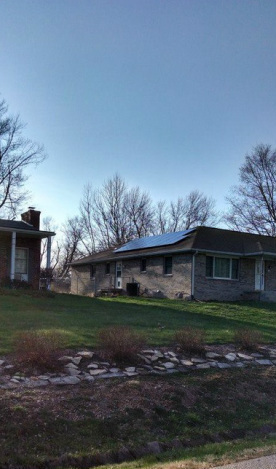 This 16 panel, 4 kW, grid-tie solar electric system provides about 85% of the electrical power for this already highly efficient home built by Cordell Construction. The lower level was built with insulating concrete form (ICF), and the upper level was conventional framing with spray foam insulation. The 4,000 sq.ft. house was built on an infill lot and was designed to match the architectural style of the older neighborhood. The rack mounting system on the roof before the panels are installed. The finished system fits into the neighborhood, just like the house did when it was built. © Steve Cordell All rights reserved.